Who builds my ad? We’ll take care of that for you! We can build the ad with content from your website, or you can send us pictures and info to use in building it. If you prefer to build the ad yourself, then that’s great too. We will provide you with the dimensions and other details. Either way works for us. Where is my ad displayed? Every page on the website has ad positions on the side, and towards the bottom of each page. When a page is viewed, the ads are randomly assigned to the positions. This allows for every advertiser to have an opportunity to be viewed in the prime positions on the site! When someone clicks on my ad, what happens? Your ad can be linked to any website on the internet! We can link it to your company website, a Facebook page, or any other webpage you prefer. 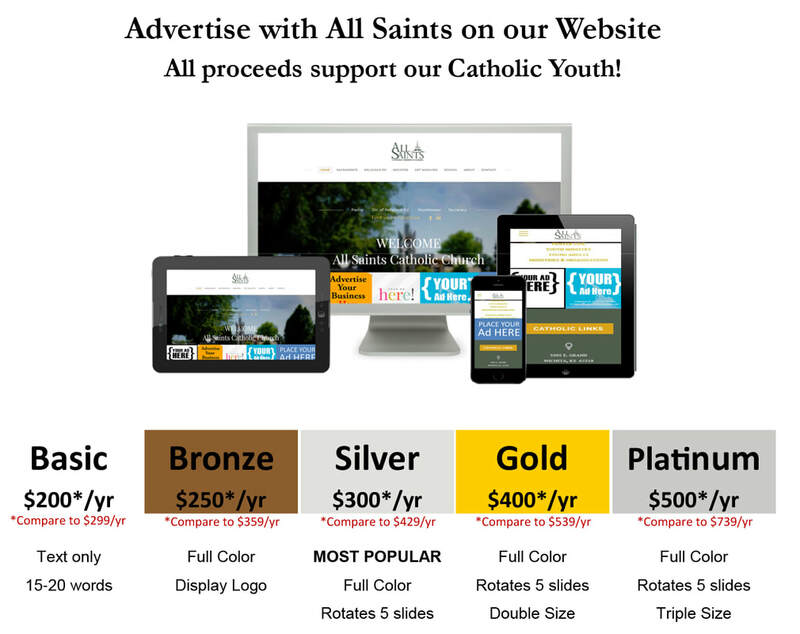 If you don’t have any of those things, then we can build a profile page on the parish’s/school’s website. There you can place your contact info for visitors to see. How often can I change my ad? You can contact us to change the ad content up to four times per year. If you design the ad yourself, then you can make as many changes as you’d like! How do I get started? The easiest way is to call Lana at the parish office at 316-682-1415. The other option is to email us at bulletin@allsaintswichita.com, and let us know what level you’d like to get started.